Check out today's pricing and retail availability for F. Stephen Millier Angel's Reserve Shiraz. 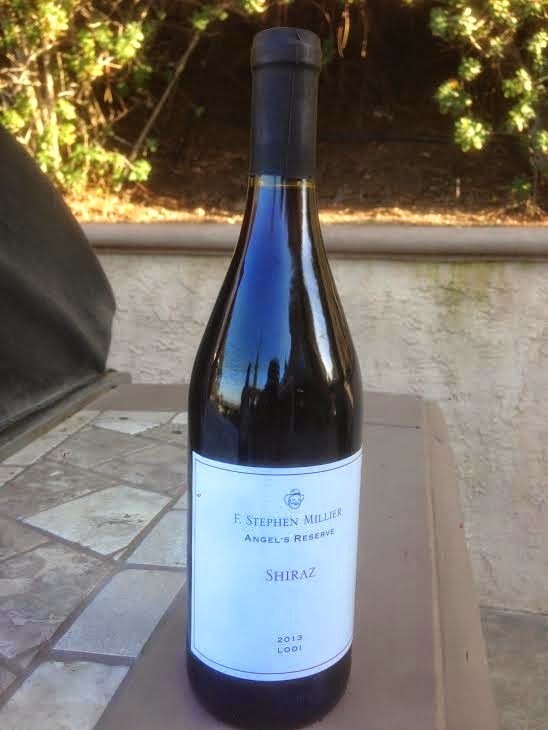 Original tasting and review : This is F. Stephen Millier Angel's Reserve Shiraz, Lodi, California, 2013, finished at 13.5% alcohol and first sampled years from vintage date, in October, 2014. In the glass: Deep red and deep magenta. On the nose: Poured at room temperature and swirled vigorously, shows bright, savory red and black fruit. From the aroma, seems like this will be full frontal with fruit and nice acids. On the palate: The primary elements on the palate are in fact soft, layered, spicy fruits, showing cinnamon and soft blackberries. Settles out broadly on your palate, with light acids bringing the sip up into your cheeks, where blackberries settle for a long finish as they drip flavors into your mouth. Nonetheless, very clean at the finish. In summary: Overall, rates three stars with a big plus on the five-star Spirit of Wine scale. Easy nominee as a best value.